Hearing loss may not seem to be in the list of priorities in health issues. Most hearing loss patients are identified by their loved ones who have had enough frustration of their own in trying to explain things over and over to their loved hearing loss sufferer. Nearly 1 out of 5 Australian live with hearing loss only to find out that the problem is becoming increasingly frustrating and they need to take some treatment for hearing loss. The sooner one recognises the problem, the quicker it is for them to achieve quality lifestyle and peace of mind undergoing a hearing loss treatment. Before moving on with hearing loss treatment, it is important to understand a few facts. Quality of life significantly improves with better communication. Hearing everything well is the most important mode of communication. Difficulty in hearing leads to difficulties in family, work and social life. The hearing loss varies from situation to situation, and so does the treatment for hearing loss but overall the quality of hearing decreases as the person gets older. And it calls for immediate treatment for hearing loss. So! How do we recognise the signs of hearing loss? Let's jot down these signs in few simple words. Sound has many frequencies. Some sounds are high pitch some are low pitch. If you are having difficulties in hearing sound in any frequency, you got a problem in hearing. Indentify your loss type and choose the hearing loss treatment accordingly. Have you ever noticed those birds early morning are not chirping anymore? Well, they might be very well chirping, but you can't hear them anymore. If you are watching TV or listening to Radio and someone tells you to put down the volume, you might be having the signs of hearing loss. Did someone ever tell you that you need hearing aids? Well, that's the sign to go and get your hearing tested and opt for the treatment for hearing loss. If you feel that you or your loved one needs a hearing test, then this is the right place to start. 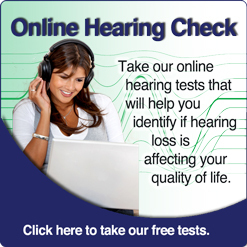 Take a free hearing test right here on Global Hearing website. Please click here and we would be delighted to be of any help. Visit us and get to know what hearing loss treatment you can avail. Conductive hearing loss results from a blockage in the ear canal making it difficult for the sound to pass through the outer ear and/or middle ear. This can happen due to excessive earwax, tear in eardrum or fluid build-up due to infection. Getting hearing loss treatment for it sooner is highly important. Classic symptoms include earache, secretion or drainage of fluid from ear, and a feeling of pressure and blockage in the ear. It may cause you to turn up the volume on TV or radio, asking people to repeat their conversation, or hearing in one year better than the other. This kind of hearing loss is medically treatable and causes mild to moderate in severity. In most cases, a full hearing is restored after the hearing loss treatment. People with sensorineural hearing loss will often feel that others are mumbling or music is distorted even when the volume of TV or radio is significantly higher. hear people speaking, but can't always understand all the words, even when the volume is adequate. Music may also sound distorted, leading to decreased enjoyment. Visit our site to know what hearing loss treatment are available for this. This type of hearing loss is the combination of two or in multiple spots of auditory path that includes outer, middle and inner year. Hence, the name mixed hearing loss. Just as the location of this hearing loss is mixed in nature of auditory path, the causes of this hearing loss are also the combination of both conductive and Sensorineural hearing loss. For example, someone with inner ear damage due to long term exposure to noise in their workplace and is suffering with an infection in the ear canal. This hearing loss treatment is not to be delayed for long. Ageing may be one of the factors for hearing loss, but studies and statistics have show that around 37 percent cases are due to long term exposure to noise either through working conditions or lifestyle choices. At the same time, another study shows that almost 50 percent of Australians who experience hearing loss don't even fit in the retirement age of 65 years of age. The statistics also show other causes like, infection or injury at 17 percent, birth or antenatal loss at 4.4 percent and all the other causes contribute to 16.8 percent. Exposure to noise being the leading cause, whether it be work related or social and lifestyle choices, the approach to protecting ones ears from loud or prolonged noise is recommended for all Australians. 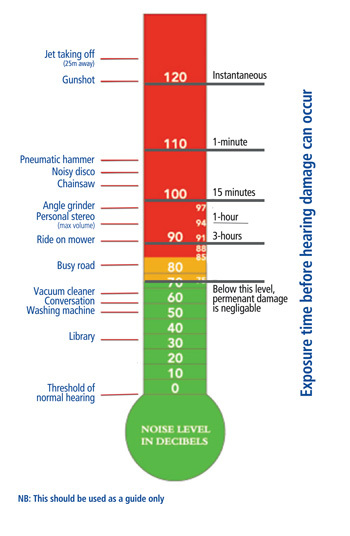 The chart below demonstrates the time and noise level it takes to damage one's hearing. If you believe that you may be experiencing the symptoms of hearing loss, it is important to do something about it as soon as possible. Delaying hearing loss treatment can lead to sensory deprivation and leave you exposed to a range of social and physiological impacts. Treatment for hearing loss varies as per the type of loss. Before proceeding with a hearing loss treatment, you will first have to identify the type undergoing a test. Further, the audiologist will guide you with the right kind of hearing loss treatment. Never delay with the treatment for hearing loss as it will only bring in more pain and increase the trouble. At Global Hearing you will get the expert guidance about treatment for hearing loss. With the right knowledge, you can get the best of hearing loss treatment.